The Captain Robert Falcon Scott Memorial at Mount Wise, Devonport. At Mount Wise, Devonport, is a statue and memorial to Captain Robert Falcon Scott CBVO RN, who was born in 1868 in Outland House at Milehouse and who led an expedition to reach the South Pole but found he had been beaten by the Norwegian explorer, Roald Amundsen. His team perished in the sever weather conditions on the return journey, Captain Scott being the last to die, on either January 17th or 18th 1912. 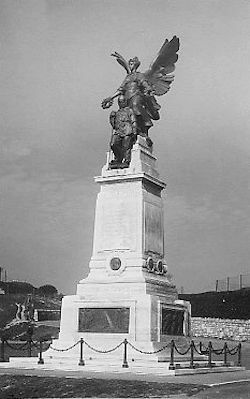 This Memorial was unveiled on Monday August 10th 1925 by the Commodore of the Royal Naval Barracks, C W R Royds, who had accompanied Scott on a previous expedition. It represents Courage, supported by Devotion and crowned by Immortality. Fear, Death and Despair are trampled under foot. The bronze medallion contains the portraits of Scott and his fellow explorers, Oates, Wilson, Bowers and Evans, who also died on the trek.